Despite my love for science fiction, boltguns, space ships and transhumans I cut my wargaming teeth over 20 years ago on fantasy games like Hero Quest fuelled by history lessons learning about Rome and Ancient Greece, cartoons like Dungeons and Dragons and movies like Jason and the Argonauts. So when I came across Megalith Games and Godslayer I was cast back to those days. Of Gods of heroes, beasts and men. Godslayer takes all that wonderful sense of myth and wonderment, of armies of armour soldiers and creatures of legend and plonks them all nice and tidy on to a 4×4 board. And frankly, I could kiss them. 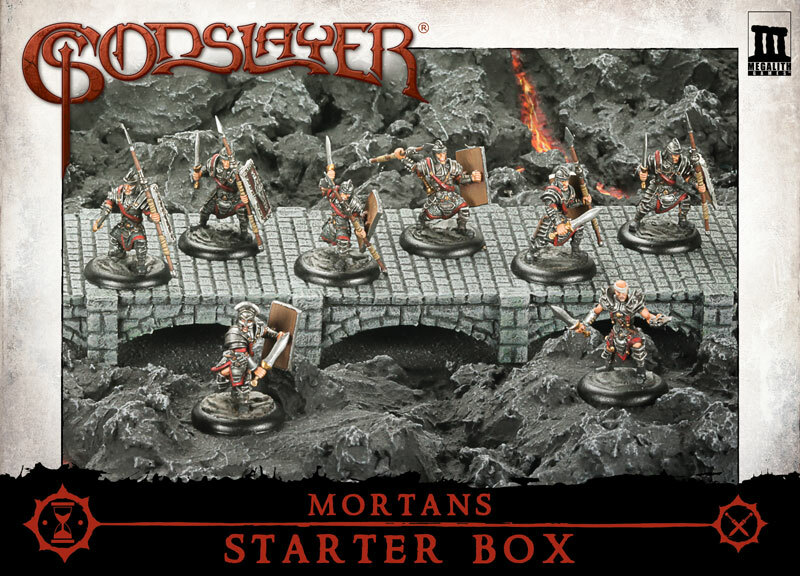 Megalith sent me a starter box of the Mortans. 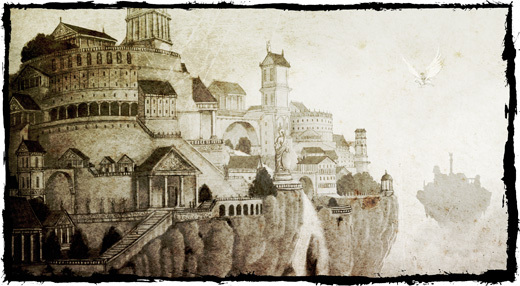 Think a collision of Ancient Egypt and Rome with a twist of undead beastlyness and you’re in the right area. And you know what? They’re way cool. But what do you get in the box? Simply put – 8 blokes, the quick start rules and unit and equipment cards as well as counters to cut out. I’ve got to comment Megalith, the production values of the quick start rules and the cards are very very good. The cards look and feel beautiful and actually look nice than the ones you get in a Spartan starter box. The models are great. Although predominantly Romanesque, the Egyptian influences are all there, including the high cheekbones and regal bearing. All wrapped up in some pretty serious armour and large pointy weapons. The detail is generally pretty good. The armour is logically thought out so there’s no stupid sculpts to hide the bit no one knew what to do with and they’re all very dynamically posed which ties in nicely with the fast paced face kickery of the game. The quality of the sculpts are good too. The features are sharp, the armour detailed and with very few mould lines. Similarly, the quick starter rules are very nicely presented. They’re a little on the light side compared to some starter boxes but I guess the important details are there. Did have to read it through twice though as in an effort to save space the diction took a dive. But there’s a fair bunch of rules crammed into a very little book so fair’s fair. I love the feel of the game. It’s every bit like books of myth and legend and Megalith have worked very hard to create a whimsical yet rich background that I suspect will only get richer if their kickstarter is a success as there’ll be a lovely big glossy rule book. Plus the artwork is cool and, again, evokes that same sense of wonderment. I’m rather taken with this game. Aside from Greeks and Romans running around with Dwarves and beasties it has some very very clever rules. The main one being that players are not free to move whatever they like during a turn (which is effectively a sub phase/unit activation) but have 4 options that forces you to carefully plan out how your force will behave. The right activation option at the right time can allow you to move a character and a unit together for a decisive strike. 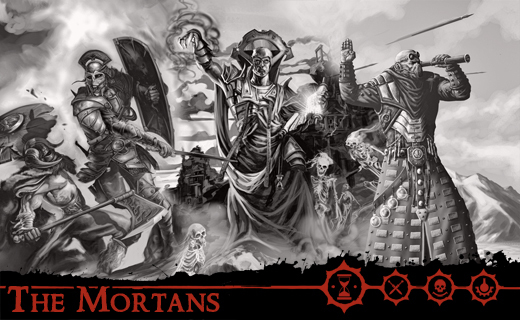 Models get to perform set numbers of actions as part of their activation which means that models can move rapidly to redeploy against a developing threat or beat the living daylights out of a group of unsuspecting meat bags, just like the legends of old. As we’re on the subject, the face kickery is very quick to resolve. 2D6 plus Melee ability, compare against Defence. What’s really cool is, if you’re attacking rather than charging, you can choose to either boost your Melee or Power – the latter of which helps determine the extent of the damage your face kickery causes. Rather shrewdly, Megalith managed, to balance the injury mechanic so, on average, a model will only take a point or two of damage in a scrap which means that although the game is quick the body count won’t wrack up too quickly. Although, once things start to get tasty it certainly will. But that’s exactly as it should be. And I suspect that the individual characters are quite capable of inflicting such misery. But with the alternate activation it means that a bad call or a rushed attack can be pulled back from the brink. Unless you’ve tried to kick in a Troglodyte Hammerfist then you deserve everything you get. My only gripe is that it will mean paperwork combined with stat cards which I’m not a massive fan of. Especially as it’ll mean keeping track of wounds with dice or counters on top of having to keep track of actions. But that’s purely a preference thing, and it’s still a million times better than Battletech with its colouring books. I’m also not sure how it’ll stack up in larger games. Although beasties and war machines will thin the herd with alarming efficiency so I guess it’ll work fine. Godslayer is a lot of fun from what I’ve seen so far. The models look good, the rules work and it’s quick to play which means you can smash out a game in an afternoon if you fancy, which only bodes will for the time strapped age within which we find ourselves. And there’s a faction for everyone. It’s also a game that encourages you to have a lovely scenery filled board rather than larger scale games like Warhammer where scenery slows the play down. More is definitely more. Because it is. Obviously. Megalith currently have a Kickstarter going with a few days left and I think it’s well worth a punt if mythical manging of faces is your bag. And why wouldn’t it be? Anyway, click here to go to the kickstarter page. I like the look of the mini’s as I am more of a modeller than a wargamer (board games are my preferrence) but I’d like to check it out as there are far too many Sci-Fi wargames floating around at the minute and I always have a greater leaning to fantasy. Great review, thanks.